Hamstead’s Artist 60+RT is a unique amp that has to be on any ‘must-try’ shortlist. Exceptional build quality and attention to detail. Gain fiends might want more from the high-gain mode, but a decent drive pedal such as Hamstead’s Odyssey will see to that. Based in the electric guitar hotspot of South Cambridgeshire, Hamstead Soundworks has steadily been gaining worldwide recognition for its superb handmade amps and pedals over the last few years, ever since the launch of the Artist 20RT, a single-channel boutique design. The brand has its own cult following and a select user list, including James Bay and Carl Verheyen, alongside hardworking session pros such as Adam Goldsmith and Neil Cowlan. Now, a new amp in the catalogue promises to take the Hamstead sound to new heights: the Artist 60+RT. This latest addition certainly stays true to the Hamstead ethos, with superb build quality using top-grade materials. The cabinet dimensions are slightly taller and deeper than average, but slim plywood panels and an aluminium chassis balance the visuals, while helping to keep the head quite portable. The Artist’s understated, almost minimalist styling is underscored with exceptional attention to detail that holds up under the closest scrutiny. The blonde vinyl on our sample is perfectly cut and glued, with subtle black piping accents, while the combination of chickenhead knobs, chrome LED bezels and brushed silver control panel is more in keeping with top-end hi-fi gear. Underneath the Artist 60’s handsome exterior, the electronics are equally impressive, with a high-grade fibreglass PCB for the small components, custom-built transformers and meticulous hand- wiring to valve bases, pots and switchgear. The hand soldering is cleaner than almost every other amp we’ve looked at, giving off an overall vibe of impeccable quality and military spec reliability that comes from designer Peter Hamstead’s background in radar and avionics. Like its smaller sibling, the Artist 60+RT is a single-channel design with some interesting twists. A pair of Hi and Lo sensitivity input jacks feeds a preamp with controls for gain, bass, treble and a master volume. There’s a three-position bright switch, while midrange control comes in the shape of a function called ‘Voice’, which boosts upper mids and can be pre-set at three different levels from a rear panel toggle and switched on and off from a foot controller or the front panel. There’s also a rear-panel gain switch that pre-sets the Artist for high-and low-gain operation, and a footswitchable series effects loop. The RT bit of the Artist’s name refers to the long-pan reverb spring and tremolo. The reverb has controls for Depth and Tone, while the tremolo has Speed and Depth knobs. Both effects are footswitchable and there’s a cool extra on the rear panel, in the shape of a switch that lets you decide which order you want the effects to sit in your signal path. With reverb followed by tremolo, the Artist functions like most classic vintage amplifiers, which means at higher reverb level and tremolo depth settings you’ll hear the reverb tail cut off as the tremolo dips the volume. Putting the tremolo first creates a more natural effect, closer to what you’d hear playing your amp in a big room or hall, or adding reverb through an aux send in the studio. To our knowledge, this small but creativity-expanding feature is unique to Hamstead; effects supremo Strymon offers a similar function on its Flint pedal, but we don’t know of another valve amp that does this. Other useful rear-panel features here include a power output switch that selects seven, 20 or 60 watts, together with external bias test points and adjustment pots, to keep the Artist’s pair of EL34s running at peak efficiency. First off, noise levels are practically inaudible, including the optical switching from the slim but tough four-button foot controller, making the Hamstead a great studio operator. Switched down to 20 or seven watts, it’s possible to drive the output stage hard at relatively polite volume levels, though bedroom heroes should note that on the seven-watt setting with the master cranked, it’s still surprisingly loud through the matching Celestion-loaded cabinet. As with the Artist 20 before it, which we looked at back in 2014, the overdrive character isn’t easy to pin down. However, there’s plenty of gain for classic rock soloing, and crunch chords sound great, too, with hints of Vox and JTM45. Select 60 watts for maximum clarity and headroom, tweak the bright and voice switches, and the Artist leans more towards Fender territory with a really impressive 60s ‘blackface’ vibe, especially with the effects engaged. The medium-fast attack and friendly dynamic response is great for all playing styles, with no real preference for single coils or humbuckers. We tried the Artist out with a variety of different guitars and they all sounded equally impressive. The simple EQ arrangement helps here, making it easy to balance the amp for single-coil bite or humbucking warmth. The reverb and tremolo effects cover most players’ needs. The tremolo is most usable in the middle third of the control’s travel, with some wacky, almost ring- modulation effects if you max out the speed and depth. The spring reverb’s Tone control is useful for taming higher levels where things can get a little too splashy. However, at more sensible settings there’s a nice ambience that adds a very pleasing three- dimensional warmth. Here’s an amp that is set to win a lot of friends. 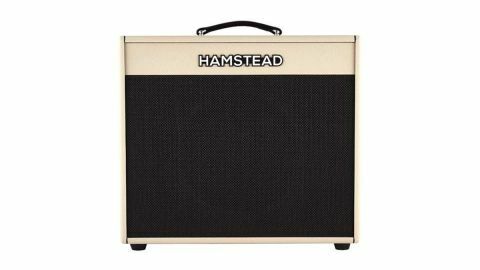 Those increasingly familiar, cool and understated Hamstead visuals are matched by an impressive range of tones, while its clarity and headroom make a superb platform for all kinds of pedals. This amp is plenty loud enough for any kind of gig, yet it can be easily tamed for smaller venues and studios, where the practically non-existent noise floor gives it an edge over most of the competition. Top-drawer design and painstaking attention to detail come at a premium, but despite the price tag, we think the Artist 60+RT is great value for money, with a build quality and sonic superiority that can only be challenged by a few brands costing at least as much, if not a lot more. Aimed at serious pro players and dedicated amateurs for whom only the best is good enough, Hamstead’s Artist 60+RT is a unique amp that has to be on any ‘must-try’ shortlist.